Suppose many players are familiar with the infrared scanning camera with IR marked cards. Why does it called infrared poker camera? Does it matter with the infrared light? and what is it? Infrared (IR) is invisible radiant energy, electromagnetic radiation with longer wavelengths than those of visible light, extending from the nominal red edge of the visible spectrum at 700 nanometers (frequency 430 THz) to 1 mm (300 GHz) (although people can see infrared up to at least 1050 nm in experiments). Most of the thermal radiation emitted by objects near room temperature is infrared. But most of poker players don't know the the infrared divide to near infrared light and far infrared light, what is the different between the two kinds of infrared light? Of the far infrared poker camera is better than near infrared poker camera? Defined by the water absorption, and commonly used in fiber optic telecommunication because of low attenuation losses in the SiO2 glass (silica) medium. Image intensifiers are sensitive to this area of the spectrum. Examples include night vision devices such as night vision goggles. Far infrared (FIR) is a region in the infrared spectrum of electromagnetic radiation. Far infrared is often defined as any radiation with a wavelength of 15 micrometers (µm) to 1 mm (corresponding to a range of about 20 GHz to 300 GHz), which places far infrared radiation within the CIE IR-B and IR-C bands. 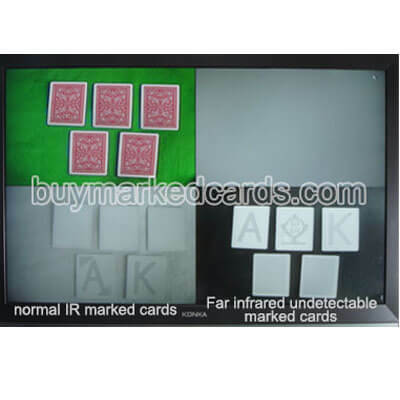 From the date as above, we can know better about the far infrared light which can see through more deeply, and we can understand that use far infrared light theory into making the Far IR poker scanner with Far IR marked cards is advanced technology. And with this technology, the Far IR poker camera and marked cards can be called customer made one to one Far IR scanning camera system. The Far infrared marked cards cannot be detected by normal infrared camera which also called Near IR camera, it can be detected by the cash detector, and it also cannot be detected by the UV light. The IR contact lenses or IR sunglasses cannot see the marks on the cards either. With that far infrared camera device, you can know each of the playing cards number and suits much more safely from another room, and then inform you pattern via the invisible speaker earpiece. And the best part is the FIR poker camera with marked cards doesn’t other light’s cooperation. We can make the FIR marked cards and the poker scanning camera work under any light. And this An-ti poker cheating device is also easy to manipulate.